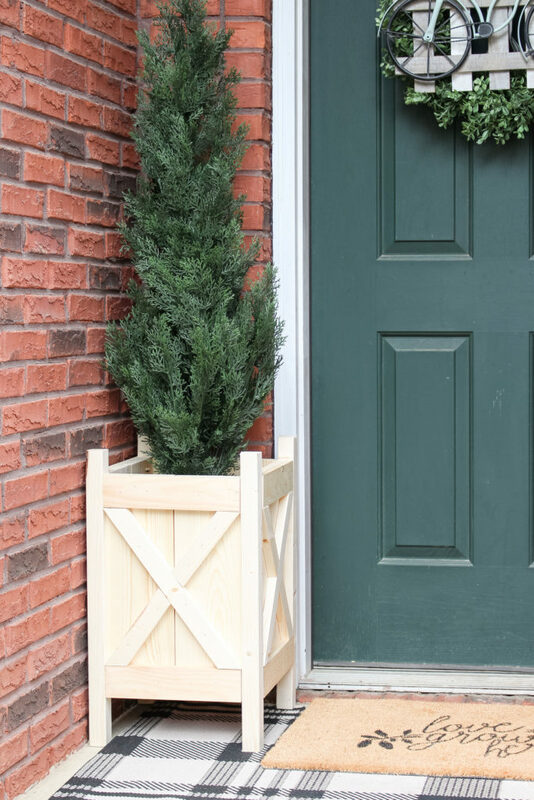 This simple, DIY wood planter box is a perfect project for the DIY beginner and will look so cute on your front porch or in your garden. 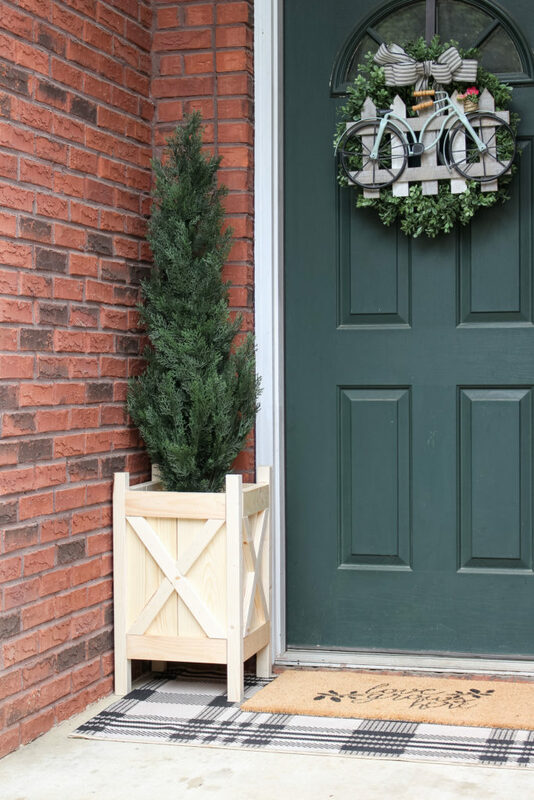 I’ve wanted to add some interest to my front porch stoop for a while now and just haven’t been able to find the perfect planter for my space. It’s a small space, so I needed a tall and narrow planter, which was hard to find. So, like anything else in my home when I can’t find the perfect thing – I figure out how to make what I want! Welcome to those of you coming over from the DIY Crock or Pottery from Thrift Store Canisters eat So Much Better with Age! Such a cute idea!! 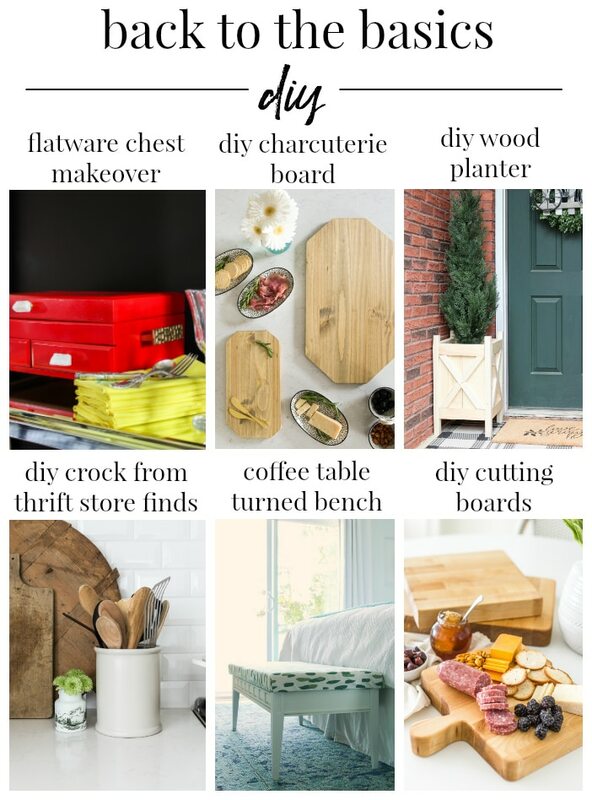 Be sure to visit the other DIYs at the end of this post. 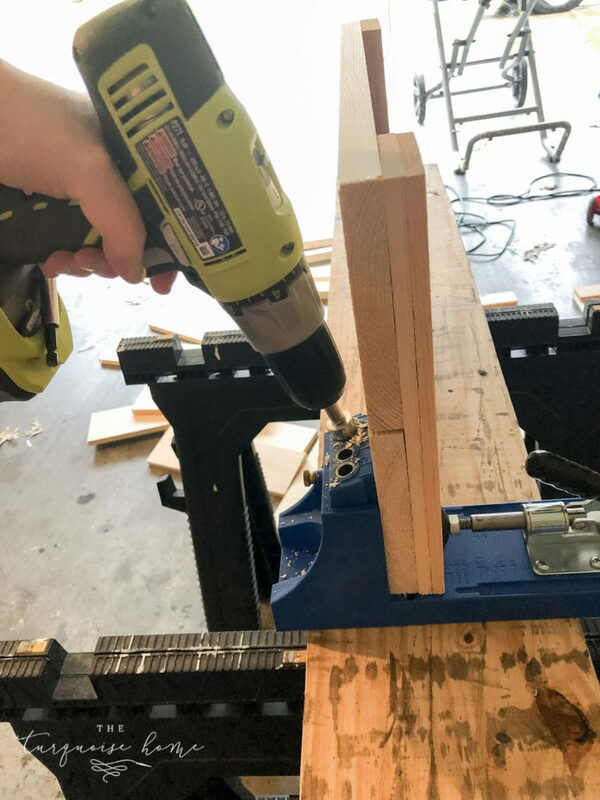 This DIY project is super simple and only requires 3 tools, which were the first tools I purchased when I started DIYing. And it would be hard to mess it up since you could only do straight cuts (if you don’t do the x’s on the sides). 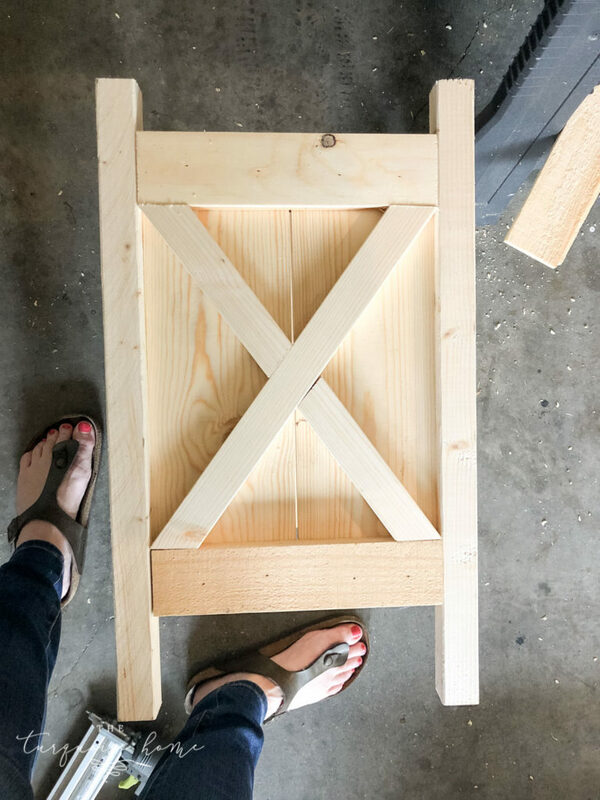 So if you’re new to DIY projects, this one would be great! I also have a black thumb, so you’ll see how I made my new planters work around my seriously lacking gardening skills. Another thing I love about this project is that it’s a great way to use up scrap boards. 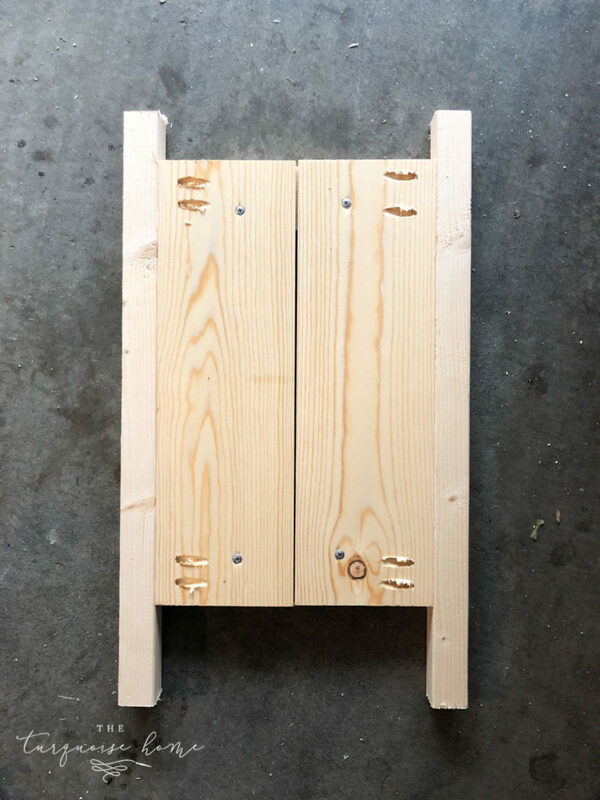 I have a rather large scrap wood pile and while I bought the wood needed for these planters, I ended up using a lot of the wood from my scrap pile and was able to return the unused boards back to the store. I used Ana White’s planter box tutorial, but I tweaked it to fit my narrow space and added the x’s on the sides to give it a more farmhouse feel. 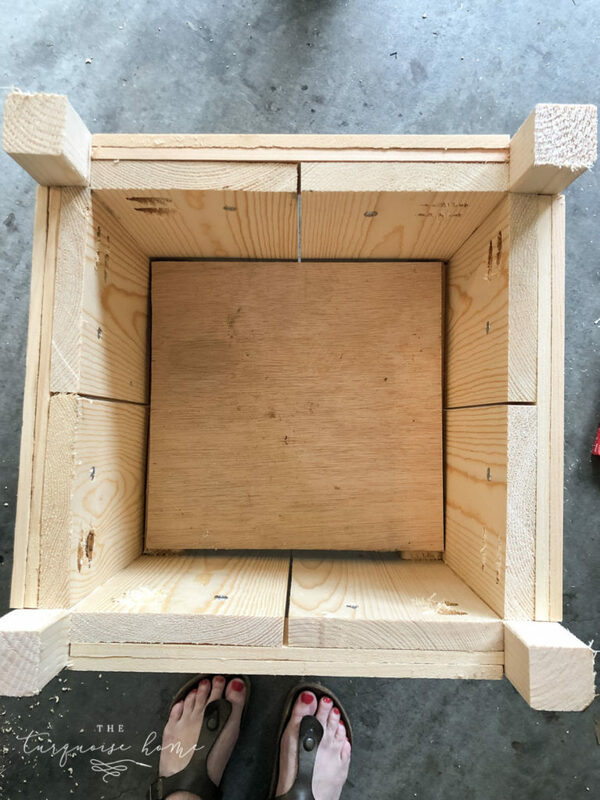 So, I will share the dimensions and the board sizes I used, but if you want to see the original planter tutorial to tweak it for your space, check out Ana’s. As with any DIY project you do, read through the entire process first before starting. Feel free to ask me questions in the comments and I’ll do my best to answer them! Note: These are the supplies needed to build one box. If you’re building two boxes, just double it, of course. Note: I don’t usually feel comfortable cutting all of the boards before I start a project, but these don’t have to be exactly precise, so I cut the first three before I started my project. It made assembling them go a lot quicker! Sides: Cut the 1 x 6 board into 8 pieces at 17 3/4 inches each. Legs: Cut the 2 x 2 board into 4 pieces at 23 1/4 inches each. Once assembled, cut the 1 x 2 boards per your planter’s side panel angles to make the x’s. I used 15º angles and 36º angles on my miter saw to cut my “x” boards. 1. Cut all boards from the first three bullets on the list above. 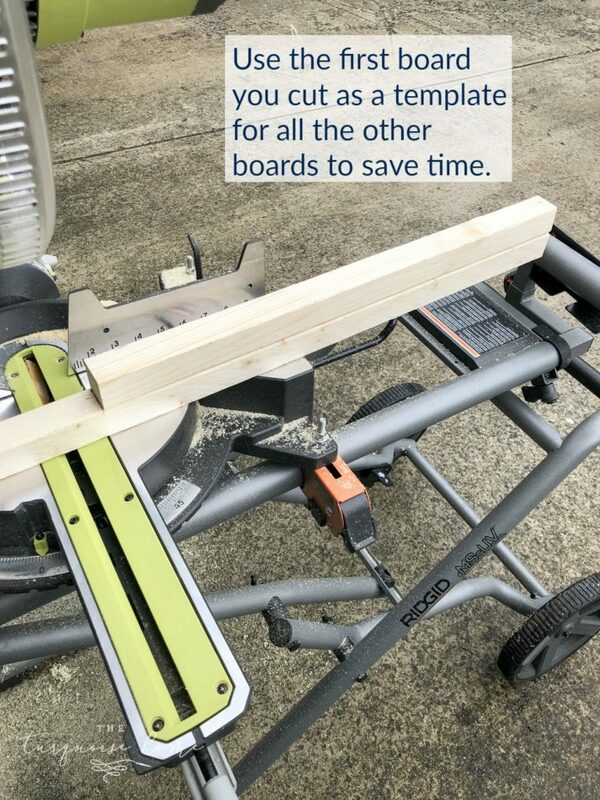 Use the first board cut as a template for all of the other boards. 2. 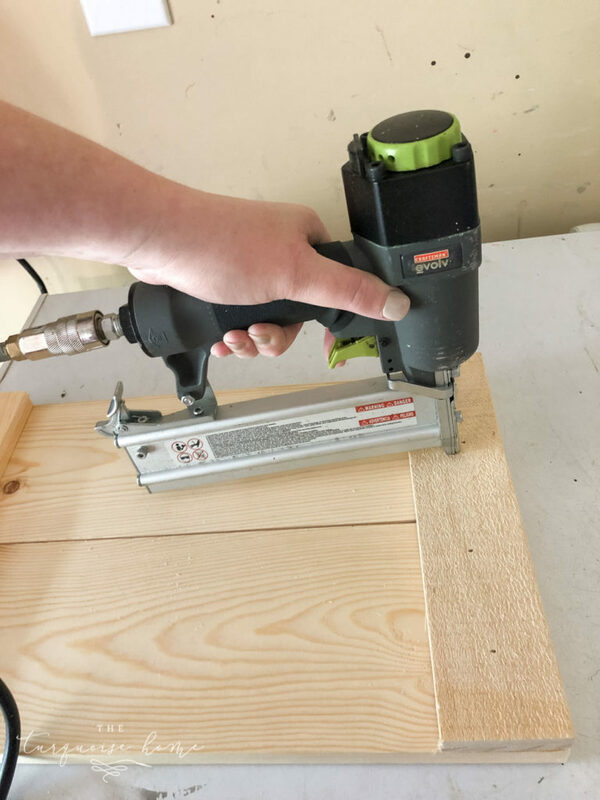 Take 2 of the 1 x 6 boards @ 17 3/4 inches each and place them next to each other and then use the nail gun/brad nailer to nail the 1 x 3 @11 inches to the top and bottom of the boards. 3. 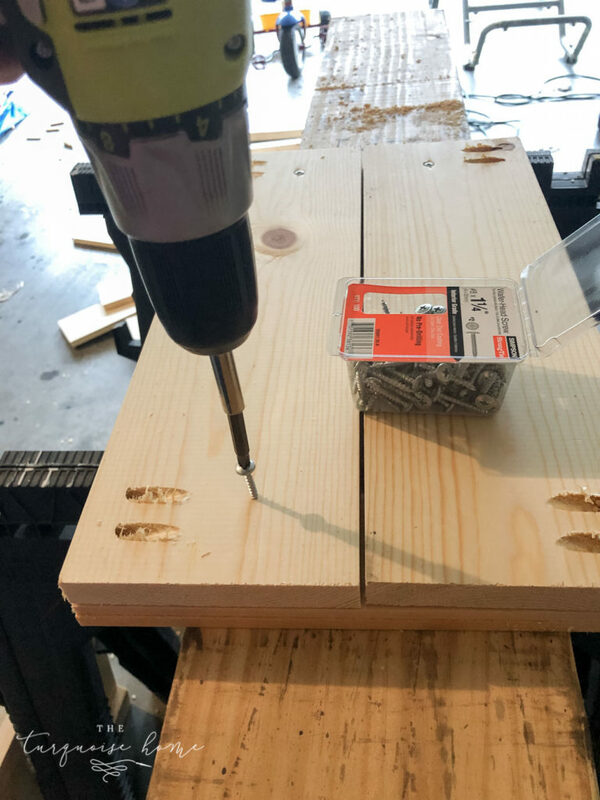 If you want to make sure the panels are extra secure, screw in a screw to the back side of the panels through the 1 x 6 into the 1 x 3, but make sure not to break through the other side! I used 1 1/4 inch wood screws. 4. 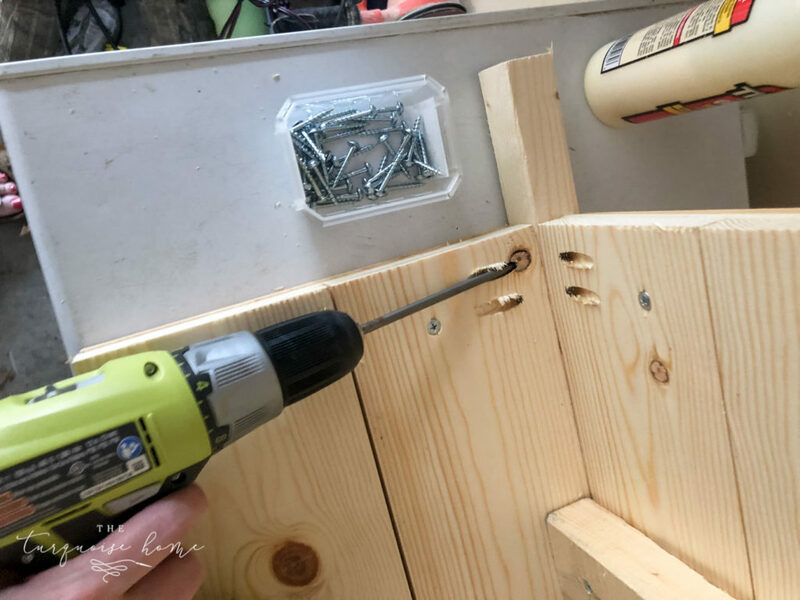 Use the Kreg Jig to put 2 pocket screw holes in the back side of each panel, underneath the 1 x 3 part. 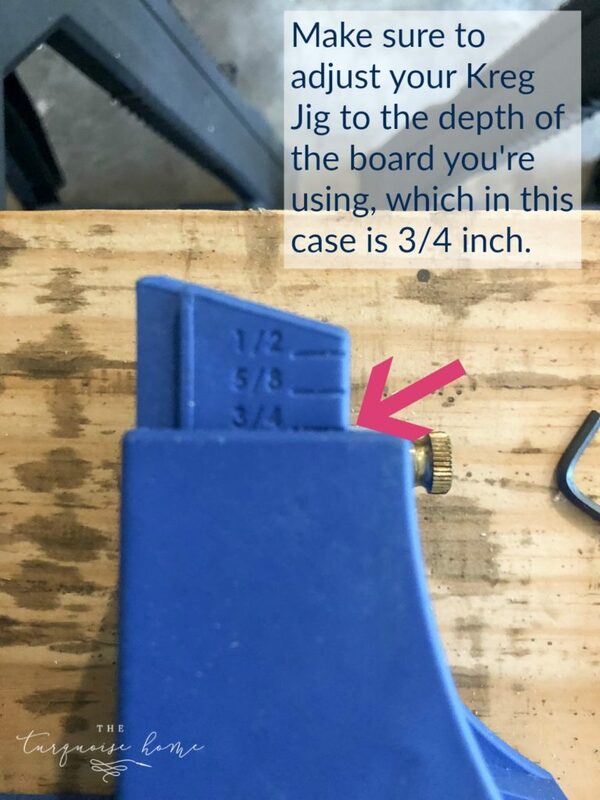 Note: Make sure to adjust the Kreg Jig and the Kreg Jig screw tool to the depth of your board, which would be 3/4 inch in this case. 5. 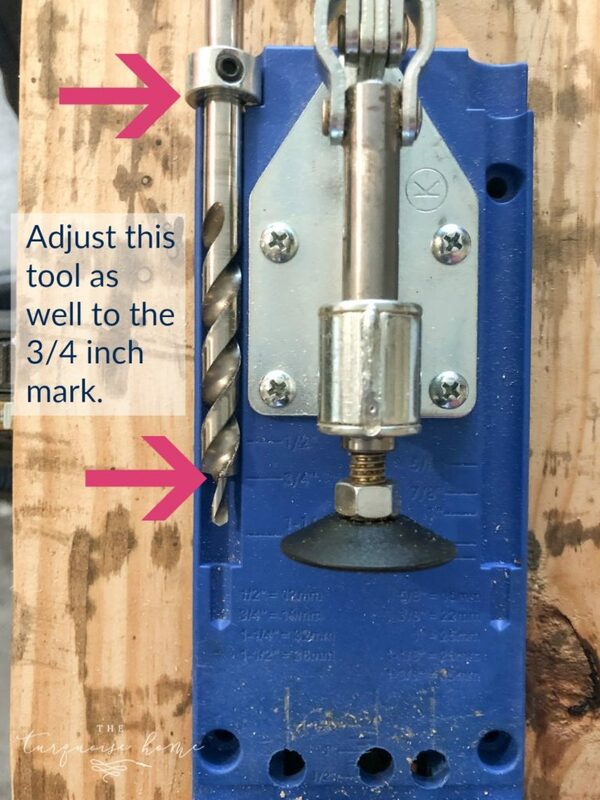 Attach two of the feet to the sides of one panel with the pocket hole screws. I measured up 4 inches from the bottom of the legs for placement of the side panel. Repeat with the other two feet and 1 panel. 6. Add the 1 x 3 cleats @ 11 inches to the inside of two of the panels. I measured 7 1/2 inches down from the top to place my cleats, because that’s how big the plant is that I’m using. But you would want to make sure your plants will fit in yours, so adjust for what you’re doing. 7. 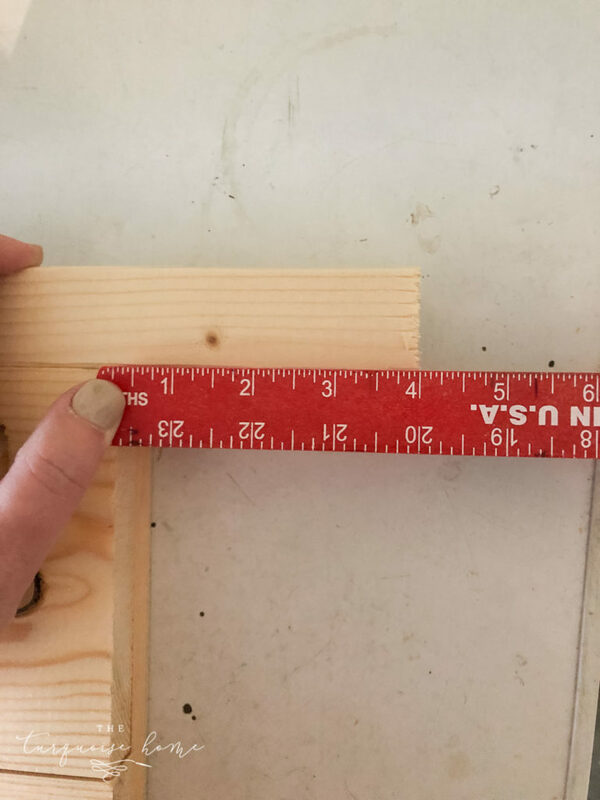 Measuring 7.5 inches from the top, screw one cleat into the inside of the panel. Repeat with another panel. 8. 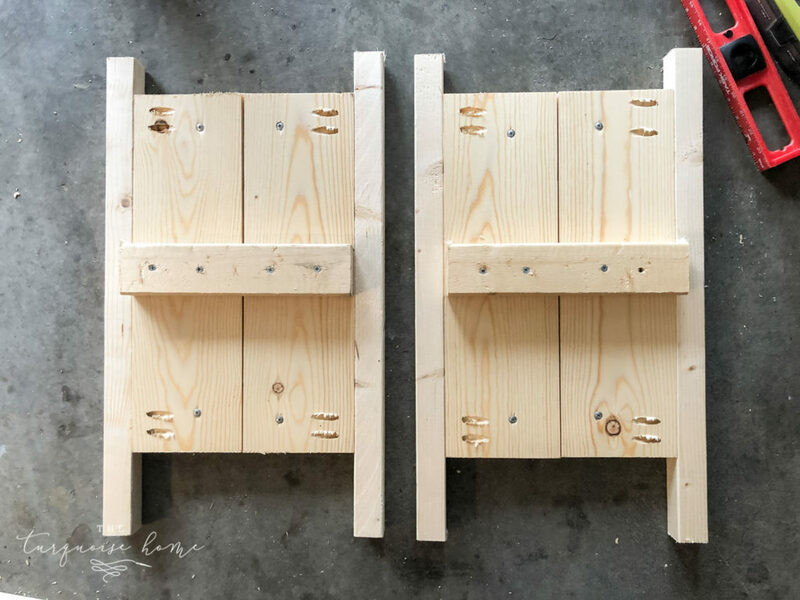 Add the remaining side panels to the legs with pocket hole screws and panels you just created. 10. Now, if you choose, you can add the optional “x” on each side with the 1 x 2 boards and brad nailer with wood glue. I recommend checking the angles of your box and cut accordingly, because it will probably be different than mine. 11. Finally, you will want to paint or stain the planters (or leave them natural) and seal them with an outdoor water sealer to keep them from rotting or molding & mildewing. I think I will leave mine natural and just seal them with something like this. Then you’re done! It’s a simple and basic DIY project that anyone with any skill level can do. I’m loving this Back to the Basics series that any DIYer can do! Keep following along on the hop as you enjoy gorgeous Coffee Table to Bench Makeover from The Happy Housie. And check the rest out below! 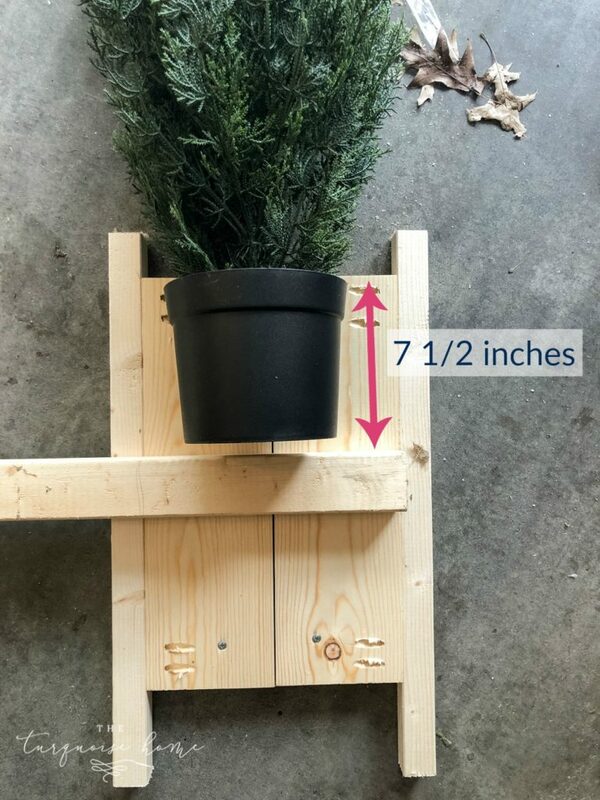 Definitely making this planter AND using fake tree (only way to go here – windy, dry and very cold in the winter. Could you please tell me where the wreath came from – particularly love the bike and picket fence in the center. Thank you for sharing. This planter is darling, Laura! Love it! It looks so good, Laura! I need some for my front door too!